I want to make myself clear, right from the get-go: I hate terrorism. Those of you who follow the Factor know that I have never been a fan. Never will be either. I think what they do, particularly to children, violence-wise, is unforgivable. That said, I'm beginning to suspect that we've been going about this War on Terror all wrong. Before, I said we should treat the terrorists like the vile dogs that they are. But even vile dogs respond well to getting patted once in a while. So perhaps the best way to stop these jihadists from destroying our way of life is to do what the liberals have been proposing all along: start coddling them. The "blame America first" crowd wants to invite these crazed Islamic extremists to visit Main Street USA, and I say let's give it a shot. Let's invite them into our homes, put them up in the guest bedroom with the good linens, and fluff up their pillows real nice. But let's not stop there. Let's take those heartless murderers out to our finest restaurants, order them appetizers and wine and dessert and then pick up the tab. Look, folks, we don't really have a lot of options left. We've spent six long years fighting this war, and I don't feel any more safe than I did when we began. So why not call up this Muqtada al-Sadr fellow and tell him that the whole Iraqi shooting match is his for the taking? Now, I haven't gone soft. I've never taken the easy road and I'm not about to start. Make no mistake, terrorists are no better than cockroaches. But as with cockroaches, if you see one, that means there are dozens more, and the more you kill them, the more there seem to be. We've tried isolating these bloodthirsty killers, bombing them, waterboarding them, locking them away in secret prisons, and still they hang on. But you know what we haven't tried? Rolling out the red carpet and treating them like royalty. Take Osama bin Laden, for example. He's still a sworn foe of mine, but trying to smoke him out of his hole hasn't been working too well. We can't seem to find this guy through violence and intimidation, so let's send him a fruit basket instead. Let's pamper him and the rest of his evil band of freedom haters. I know I've been saying for years that we're fighting them in Baghdad so we don't have to fight them in Boston. That hasn't been working out so well, and maybe it was the wrong strategy all along. Perhaps we can book them a few flights into town, make them the guests of honor at a fancy-schmancy tea party, and ask them what we did wrong to make them hate us so much in the first place. We'll eagerly listen to their demands, and immediately cave in to them. I don't care how outlandish those demands are, just give these folks what they want. We're a rich nation; we can afford it. Folks, here's the bottom line: I don't want to die. That night, we get them a room at the finest hotel in New York, preferably the bridal suite. Then we tuck them into bed, read them a bedtime story, and tiptoe quietly out of the room so as not to disturb their sweet slumber. Bright and early the next morning, we give the terrorists a good old-fashioned ticker-tape parade right there in lower Manhattan. You don't have ticker tape? Not a problem. 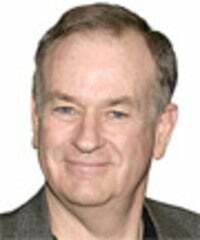 Just go to my website, billoreilly.com, and you can get some great Factor gear, including some brand-new "Let's pamper the terrorists" ticker tape. Makes a great back-to-school gift, and remember, all proceeds go to a terrorist-coddling charity.